Delaware City Schools celebrated the conclusion of a lengthy construction and renovation campaign this week. A ribbon cutting event Wednesday night at Hayes High School commemorated the official end of projects at every elementary school, Dempsey Middle School, and Hayes High School. After the ribbon cutting, attendees were given a tour of the new spaces at Hayes and were invited to tour the other buildings in the district. In 2013, voters in Delaware approved a 3.6-mill bond issue for Delaware City Schools that aimed to expand and renovate every school in the district to accommodate the rapidly growing population in district. The five elementary schools each gain extra classrooms and other spaces. Dempsey gained a new wing to accommodate sixth-graders and the high school gained a new academic wing of 22 classrooms. Craft thanked the City of Delaware, including City Manager Tom Homan and Mayor Carolyn K. Riggle, for its help during the planning and execution phases of the project. Director of Facilities and Transportation Jason Sherman specifically thanked all the contractors and subcontractors that worked on the various projects. Hayes Principal Ric Stranges said the new wing of 22 classrooms would be mostly used to teach science, technology, engineering, and mathematics, and announced that the new wing would be named The Rowland Wing, after Nobel laureate and Delaware native Frank Sherwood Rowland. Stranges said Rowland was awarded the Nobel prize after sprays that contained chlorofluorocarbons were banned by the EPA. Rowland passed away in 2012, but Stranges then read a letter from Rowland’s daughter, Ingrid, who is a professor at Notre Dame College and could not attend. In the letter, Ingrid thanks the district. 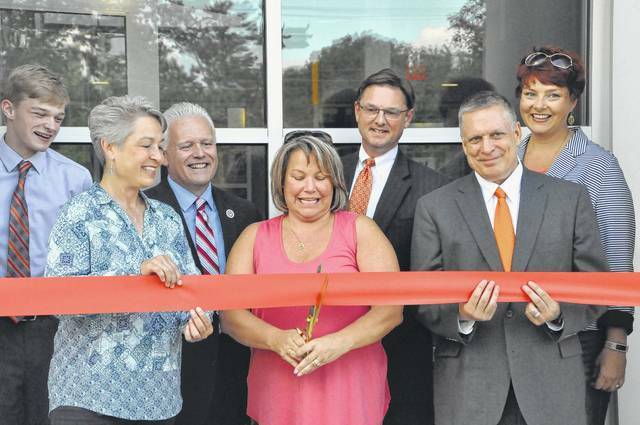 Delaware City Schools Board President Deb Rafeld cuts the ribbon on the new entrance at Delaware Hayes High School Wednesday evening. From left to right, Student Board Member Charlie Zimmerman, Board Member Francis O’Flaherty, Board Member Ted Backus, Board President Deb Rafeld, Board Vice President Matthew Weller, Superintendent Paul Craft, and Board Member Jayna McDaniel-Browning. 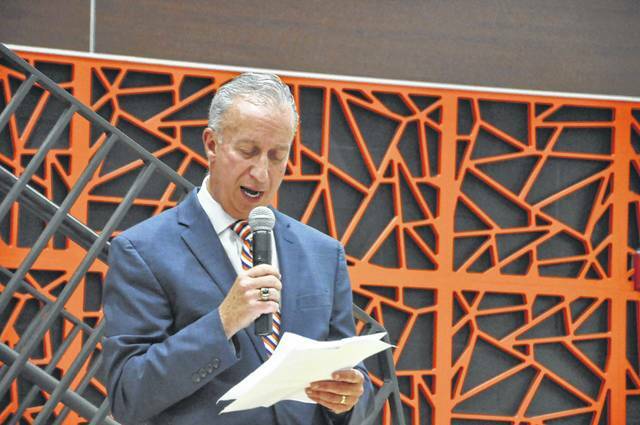 Delaware Hayes Principal Ric Stranges reads a letter from Ingrid Rowland, the daughter of Nobel laureate and Delaware native Frank Sherwood Rowland, who thanked the district for naming the new academic wing at Hayes in memory of her father.